Illumina, Inc. and Bio-Rad Laboratories, Inc. today announced the launch of the Illumina® Bio-Rad® Single-Cell Sequencing Solution at the J.P. Morgan Healthcare Conference. The comprehensive solution is the first next-generation sequencing (NGS) workflow for single-cell analysis, providing researchers the ability to investigate the coordinated contribution of individual cells in tissue function, disease progression, and therapeutic response. Single-cell analysis enables a deep view into the gene expression of individual cells to understand their functions in complex tissues. The solution delivers high-throughput sequencing of thousands of individual cells, traditionally a challenging, costly, and time consuming process. Human development and disease research, fields in which single-cell sequencing is widely applicable, is expected to benefit most from this new offering. “Single-cell genomics provides the opportunity to look at stem cells turning into neurons that are lost in diseases like Parkinson’s and amyotrophic lateral sclerosis (also known as Lou Gehrig’s disease) with much higher accuracy,” said Clive Svendsen, PhD, Director, Cedars-Sinai Board of Governors Regenerative Medicine Institute in Los Angeles. His laboratory tested the application of the new platform to profile single cells used in modeling neurodegenerative diseases. “Using the solution made it possible to detect single cells in a population that was maturing faster than others, allowing us to produce better models of disease,” added Ritchie Ho, PhD, Project Scientist in the Cedars-Sinai Board of Governors Regenerative Medicine Institute and lead researcher for the testing. The solution comprises the ddSEQ™ Single-Cell Isolator and SureCell™ WTA 3’ Library Prep Kit. Bio-Rad’s best-in-class droplet partitioning technology, Droplet Digital™ technology, is used to isolate and barcode single cells for downstream sequencing on many of Illumina’s leading NGS instruments. The comprehensive workflow solution includes primary and secondary data analysis conducted via the BaseSpace® Informatics Suite, Illumina’s cloud-based genomics computing environment, and tertiary data analysis and visualization with SeqGeq™ from FlowJo, LLC, the market leader in flow cytometry analysis. 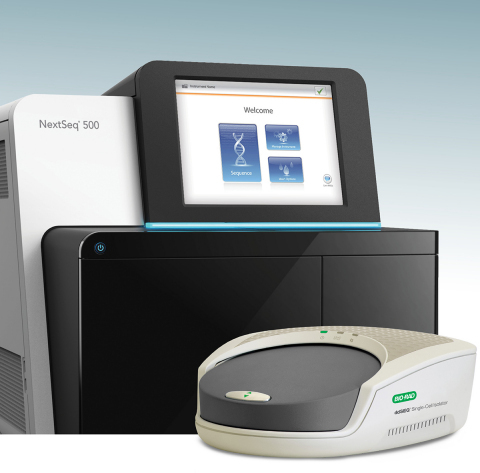 The Illumina® Bio-Rad® Single-Cell Sequencing Solution will begin shipping in early February.